The Clayton Column: Three Months Old! Nora turned 3 months old on March 4th. She is still such a happy, easy-going baby. She has been to almost all of her brothers' soccer games since we started taking her out of the house, and she is used to being toted here, there and everywhere. Nora is smiling more and more and starting to make lots of new noises, especially gurgles and coos. She will get very serious and look you right in the eye and "tell" you a story with her gurgles. It's very sweet. At 3 months, Nora is still eating about every 3-4 hours during the day. At night, her last feeding is around 10:00 or 10:30 and she sleeps until about 5:30 or 6:00. I learned this month that if I just give her the pacifier, she will generally sleep another hour or more. Obviously, the timing will have to be adjusted when I go back to work, but at the 3 month mark, this is working well for us. After taking her first bottle just after the one-month mark, and doing just fine with occasional bottles since then, Nora decided at 12 weeks that she was done with bottles. Since I was returning to work the following week, we were a little panicked. I pumped every day that week and forced her to take a bottle, which for 4-5 days took about 20 minutes of convincing. Each time she would eventually take the bottle, but it took a lot of work. Then all of the sudden she just started taking them again. What a relief!! We have still been swaddling Nora at bedtime, but I'd say about 1/3 of the time she gets one or both arms out and still sleeps fine. Her naps are a little inconsistent still at this point; she generally sleeps between every feeding, but it varies whether it's a long, solid nap or just a catnap. A lot depends on what we have going on that day! Overall, we have a very happy and laid back baby on our hands, especially when her big brothers are around! 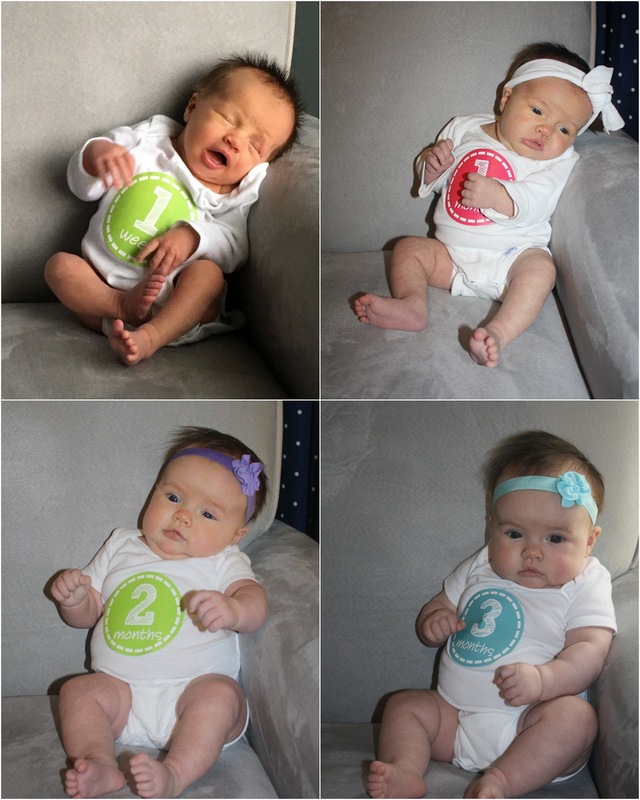 And a comparison from 1 week, 1 month, 2 months and 3 months. Growing girl! !